Rockstar Cheer originated in Greenville, South Carolina with the vision of creating a competitive cheerleading gym that could train athletes to be the best they could be while teaching them values, work ethic and life lessons. With a strong drive and passion for children Rockstar Cheer & Dance has become the most successful athletic program of its type in South Carolina as it serves as the top competitive cheer& dance program in the area. As Rockstar Cheer enters its 12th season we can proudly say that we have earned over 400 National titles, 6 WORLD medals (3 silver and 3 Bronze) and over 20 top 3 Medals at The Summit! In March of 2018 Scott Foster, owner and founder of Rockstar Cheer collaborated with Matthew Burnham to bring Rockstar Cheer to Myrtle Beach, SC expanding the All Star Cheerleading reach to athletes from ALL of Horry County and the coastal part of the state. 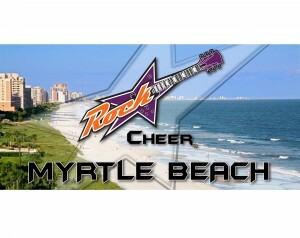 We are extremely thrilled to start the Rockstar expansion in the Myrtle Beach Area. Matthew Burnham Fulmer, Owner, started gymnastics at the age of 3 and earned many state and some national titles. At the age of 14 he made “the best decision of my life” by making the big switch to All Star Cheerleading as an athlete, and a coach. He was scouted by the world champion program Georgia Allstars to cheer on their premier Coed 5 team. After a successful year with GA, he moved back home to Columbia, SC where he worked for severeal all star gyms and eventually began working for one of our locations, Rockstar Columbia. Now finally after having put in over 10 years in the industry, he was ready to make the big commitment of owning his own gym. We pride ourselves on being a family, not a business; and look forward to making you a part of our Rockstar family! Please feel free to contact us with any questions. We look forward to speaking with you! DON’T YOU WANNA BE A ROCKSTAR?